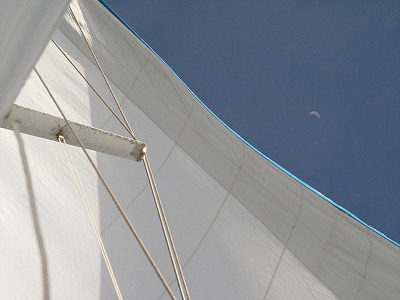 Sailing along smartly on a glorious sunny day. 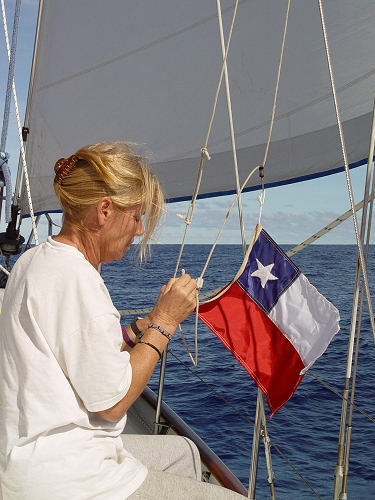 Marcie readies the Chilean courtesy flag in preparation for arrival at Easter Island. I'll tell you right away, today was a glorious day. After umpteen days of low gray overcasts, rain from sprinkles to downpours, and wind from every point on the compass (or no wind at all), today was sunny and warm with widely scattered fair-weather clouds. What a relief! It was so good to find out, in the most direct and pleasant way possible, that it wasn't going to rain all the time. We were handed, on a platter as it were, a delightful sunny day. Everybody enjoyed it. We were forced to make some immediate tactical changes—foul weather gear was stowed and out came sunglasses and even sunscreen. After so many days of rain, clouds, and cool dampness, I was beginning to mildew and turn into a mushroom, and it was nice to dry out and warm up. In fact the day was a gift from the gods—if there's anything you can't control, it's the weather. It was such a nice day Jelly not only came up on deck, she also hopped on top of the dodger, which is a place she hangs out when she wants a quiet, secure, out-of-the-way place to laze about. This was the first day in many that was warm and dry with only slight boat motions. Some other days, she would have been thrown off the dodger by violent rolling, blown off by strong winds, or washed away by downpours. We had been sailing slowly with a fitful wind so on my late afternoon dog watch I started computing arrival times at Easter Island. We had wanted to arrive tomorrow, and I asked David and Marcie what time. As might be expected, morning sounded like a good idea. After some discussion and figuring, we decided it was time to start motoring. To preserve our morning arrival time, we would have to motor through the night, unless the winds picked up substantially. 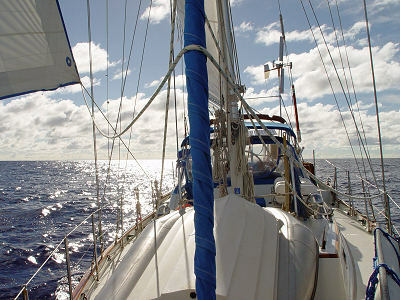 Unfortunately, the winds have been so weak it would take two more days if we tried to sail the remaining 67 miles. Ergo, motoring. A big advantage of motoring is the relative abundance of electrical power, thanks to the beefy 150-amp alternator. It's especially nice when motoring a few hours, since I can run the inverter to charge both of my camera batteries, which take a couple hours each to recharge. This is a long time, but the good part is that a fully-charged battery can last for two or three days of heavy shooting—the battery life for the Sony camera is quite good. So far, I've never run out of juice in the field; I've always managed to find enough charging time here and there to keep the camera going. I'll need extra juice once we arrive at Easter Island, because we'll have to do our island touring fast and furious. I don't know how long we'll be able to stay there, and because of the need to keep the boat manned, each person will have only a percentage of the time available on shore—the rest of the time will be spent baby-sitting the boat. 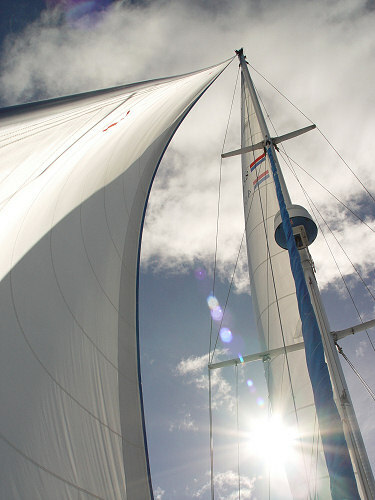 Sailing along smartly on a glorious sunny day. In the right-hand picture, you can just barely make out the moon. There was a beautiful sunset, but no green flash. The small puffy fair-weather clouds turned vivid yellow around the sun, while the high wispy mare's tails turned a pale peach color. The air was so clear that intense yellow light radiated out of the sun and saturated all the clouds in the vicinity. Once the blindingly bright disk of the sun dropped below the waves, the clouds just above the horizon glowed cherry red, like the dying embers of a fireplace log. The low clouds in the opposite half of the sky looked faintly luminous against a dusky gradient of color, from the burnt gray-blue of the earth's shadow band up to the dim dusky rose color of the fading twilight. The same kind of clouds in the sun's half of the sky looked dark gray, an inscrutable murky color. Meanwhile, the high mare's tails turned a beautiful saturated pink. The sky was literally filled with color, all the clouds at all levels, even the air itself. The graceful and generous palette of sunset spread pastel hues in broad washes across the sky, blending seamlessly from one hue to the next, with details and highlights standing out in sharp contrast, painted with bold brushstrokes dripping with saturated color. Quite and artist, this Sol, and his show takes place twice a day all over the world and has played to an audience (or to no audience at all) for billions of years. Talk about a long run of successful gallery showings!